IBM Spectrum Protect server (ISP). 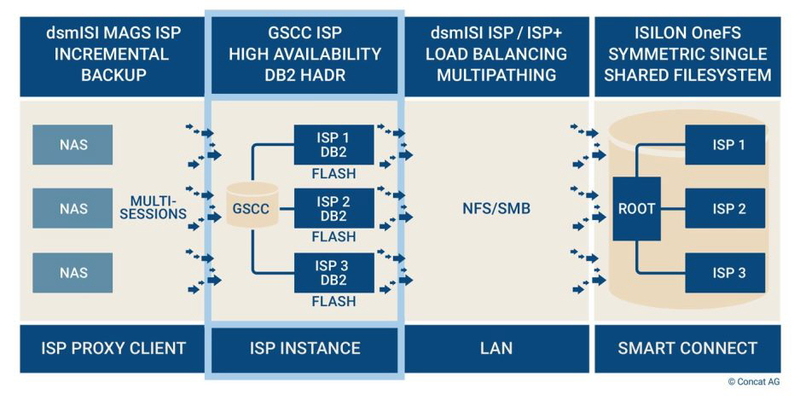 GSCC ISP is especially effective when combined with scalable Dell EMC Isilon storage. Its DB2’s HADR option enables the implementation of high available ISP server environments, without requiring SAN storage or SAN mirroring for ISP databases. GSCC is an application cluster rather than a conventional server cluster. GSCC is tailor-made specifically to the requirements of ISP servers. As a result of its application-based nature, it not only monitors and circumvents hardware failures, but also functional errors and logical application problems. GSCC handles individual ISP server instances as independent objects in their runtime environment on any server in a cluster. If a problem occurs, GSCC initially begins with local fault correction. If the error cannot be corrected locally, the virtualized ISP server fails over to another system. All necessary operating components – ISP database instance, IP addresses, and SAN connections etc. – are also transferred, making the process fully transparent for ISP. All GSCC features are dependent on deployed storage platforms and their capabilities. GSCC’s benefits take full effect in combination with dsmISI the perfect interface between Dell EMC’s revolutionary Isilon technology and IBM’s proven Spectrum Protect Software.